No. Whether or not you choose to participate in the restorative justice option is entirely up to you. Discuss your options with the referring deputy or the restorative justice office 303-441-1752. I don’t want to be in the conference, but I don’t want the offender to go to court either. Can the offender have a conference if I don’t participate? Yes. You may request that someone represent your interests and ask questions for you in the conference and/or you may write a statement to be read at the conference. If you wish to be informed about the outcome, we will contact you when the contract has been completed. Very little is set in stone and we wish to offer you as much flexibility as possible. If you’re interested in participating in restorative justice, you can participate fully by attending the preliminary meeting and conference, or partially- perhaps by asking someone to represent you. Boulder County Sheriff’s Office Restorative Justice (BCSO RJ) can discuss a range of options that suit your schedule and preference. You and person(s) who will be a support to you, and/or a victim advocate, the offender(s) and their support/parents, one or more members of the community, the referring deputy or other law enforcement agency representative, and the facilitators. The parties referred to restorative justice are encouraged to consult with attorneys if they wish. However, attorneys do not typically participate in the restorative justice process. Typically, a deputy will be present at the conference. If you have questions or concerns about this, please let us know. This may be the first time that you’re sitting with the offender. As such, you may feel a little uneasy at first. But the process is designed to be respectful and honest. We offer a safe space for discussion of harm, needs, and repair. You will have a chance to prepare for the conference at your preliminary meeting and you should feel free to ask for a break at any time during the conference. The conference will be a time for you to tell what happened from your perspective, what the harms are, how you have been affected, what “ripple effects” you have felt in your life, and what you need now. The person who harmed you may have little sense of how his/her choice affected you. Remember that it’s also okay to say nothing, or very little. If all you want to say is “I’m angry”, that’s fine, too. Every circumstance- and each person involved- is very different. For example, to be “made whole” can mean restitution (e.g., to cover repairs), more information from the offender (e.g. asking, “Precisely where did you go in my house?”), an apology- written or verbal- and/or meaningful community service. Feel free to talk through what you want and need at your preliminary meeting. Yes. You may withdraw at any time. If you feel your needs aren’t being met we will make every attempt to adjust the process to better suit you. What happens if the offender doesn’t complete the contract? BCSO RJ is diligent about holding the offender accountable. If s/he does not follow through on his/her obligations, we will refer the case back to the deputy. 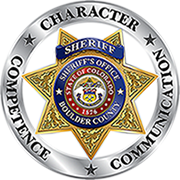 Boulder County Sheriff’s Office has a well trained staff of volunteer advocates that are available to you at no cost any time during this process. A trained victim advocate may be asked to call you to offer support. You may also request to speak to an advocate and ask them to accompany you during the preliminary meeting and/or the conference. The advocate will be with you for support but will not speak for you unless you specifically request that they do so. Our process is confidential. Each person who participates in the conference, including you, agrees to keep what they hear in the conference to themselves. Most people will want to share the restorative justice experience, and we ask that with respect for everyone involved, names and who said what not be shared. What happens if the offender completes all obligations in the contract? Completing the restorative justice process generally suggests that the offender understands the impact of the harm s/he caused, that s/he has taken concrete steps to do right by you and the community, and that s/he has learned something in the process. When all contract items are successfully completed and returned to the BCSO RJ office, a letter of completion is sent to all participants, and there are no further obligations for the offender for the incident.